These Keto Pumpkin Butter Cookies were inspired by my Keto Cinnamon Butter Cookies recipe. When I shared that recipe, I had no idea that so many of you would try it, love it, and make it your own. I have to admit I was blown away by your response to such a simple recipe. That’s one of the reasons I decided to try to give you something just as simple now that we are nearing the holiday season. You’d have to be living under a rock not to have noticed that it’s officially fall! Yay! I love fall, and I love all things pumpkin. Unfortunately, we have to be very careful this time of year because as I’m sure you know, the colder weather brings sweet treats and winter clothes. Did I say winter clothes? Yes, yes I did. Why would winter clothes be an issue? Well, believe it or not getting bundled up can cause you to gain weight. Even the great Arnold knew this secret because word has it he would wear cut off shirts in the winter so he could always see his abs! I’m not saying you should wear summer clothes year round, but don’t forget to take a look at your body frequently during the winter, step on a scale, and stay focused. Keto is not a summer sport. This is a lifestyle! 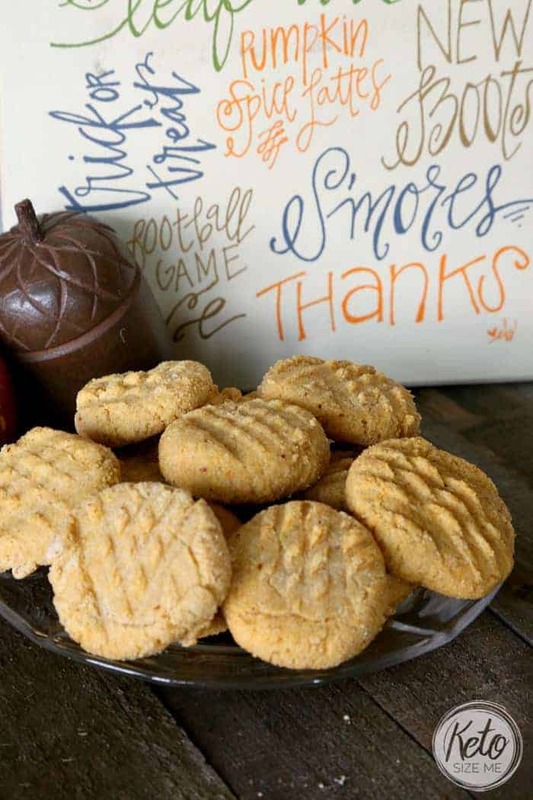 Okay, now that the pep talk is out of the way, let’s talk about these keto pumpkin butter cookies. These bad boys are delicious. These cookies would pair perfectly with a keto egg nog. They are lightly pumpkin flavored. I didn’t want to go overboard with the pumpkin because I didn’t want the carb count to be too high. If you would like to pack a pumpkin punch you can always add more pumpkin pie spice, but I wouldn’t add any more pumpkin unless you have carbs to spare. Roll into 27 balls and place on a sil-eco baking mat. Using a fork press dough down lightly. Note: Remember if you use a sweetener that adds carbs (Stevia in the Raw or Splenda) you must add that to this nutrition count. Let me know if you try them. I would love to hear what you think, and how you mixed it up! * We strive to make all of our recipes according to our dietary standards. Our recipes have to meet the following criteria: Low Carb, High Fat, Moderate Protein, Sugar-Free (we only allow natural fruit, veggie, and dairy sugars in our diet, and very little stevia), and Gluten-Free.uten-Free. Roll into 27 balls and place on a greased cookie sheet. Using a fork press dough down lightly. Can one sub out coconut flour for this recipe? I was wondering the same thing. Did you ever find out? Most likely not. Coconut Flour behaves. ERY differently from Almond Flour. Coconut flour absorbs a TON of moisture, so your cookie batter would be very dry and chalky. I did use some coconut flour on my second try and got, for me, a nicer cookie out of the deal. The first batch was a bit soft for our tastes. Used 1.5 cups almond flour, 1/2 cup coconut flour. I only used 1/4 cup of butter as well because we found the first batch too greasy. I added a few extra pinches of coconut flour after everything was mixed to get the dough the consistency I was looking for. I also baked at 325 instead of 300. Hope that helps! Thanks for the measurements. With the substitution the carbs will be a bit lower, too. Thank you!!!! Am going to try this next time! Absolutely delicious! Pumpkin isn't overpowering. Nice fall flavor. Followed recipe exactly. Did not roll into balls as my batter was a bit wet, but I didn't want to add additional flour to avoid crumbly cookies. Turned out just fine!! CAN YOU SUB COCONUT OIL PRODUCTS FOR BUTTER? Brooke, I don't think that would be a problem. I sub the two out all the time. You may need a little extra stevia and make sure you use unsalted! Let me know what you think of them! Can you leave out the sweetener altogether? I find any sweetener sets off sugar cravings for me. Sure! Sugar is always optional. Hi Christina, Macros are always at the bottom of every post! Have a great day! Do these freeze okay? or how long keep out or in the fridge, I'm in south texas so VERY humid, even now. They taste delicious. Mine turned out really thin. Do you soften butter first? I did & think maybe thats why mine turned out thin. Literally until I started reading the recipe I thought it said peanut butter. I was so confused! These look amazing though. I can't wait to try them! Can coconut flour be used instead of almond flour? Made these this morning and they were terrible. I am not a picky eater but just could not eat these. Delicious. My 3 year old liked them too which I was skeptical of since her mantra seems to be the sweeter the better most times. Mine are very cake . Should they have crunch? Cooked them longer? Love the taste, just not sure about texture. My son and I made these last night and everyone enjoyed them! We used Swerve and they turned out just fine. Thanks! Made these today and I probably won't make them again. I added 2 tbsp coconut flour to help with the wetness of the dough. All in all the texture was ok, but they tasted rather bland. Everyone tried one and at best they got an "eh, they're ok." I might use a bit more pumpkin pie spice if I ever decide to make them again. I used coconut flour thinking it would translate directly from almond flour... But but it turned out extremely crumbly. I tripled the egg and pumpkin for more moisture and added more spice and it got to the right consistency before ballin' up. Yay! Maybe I'll have to try this! I was expecting moist, buttery, pumpkin flavor; but got bland, dry almond flavor. I even tried to butter them after the fact, but still was too dry, so I crumbled them up in a pumpkin cheesecake mouse instead. Jade, I'm sorry you didn't like them but I LOVE that you still found a way to use them in your pumpkin cheesecake mouse! I hope you have an amazing day! Loved these as I make them into small cookie sandwiches by using two cookies and adding a mixture of cream cheese/truvia into the middle!! Wish I could post the picture! Great recipe. I made a few tweaks just because I always do. ;) I added a 1/4c of coconut flour , 1/4c smashed ripe banana, and swapped out half of the vanilla for maple extract. Also grated about a tablespoon of fresh ginger and used coconut nectar for my sugar. Dusted with coconut sugar on fork to press down the cookies. Delicious! Thanks again.